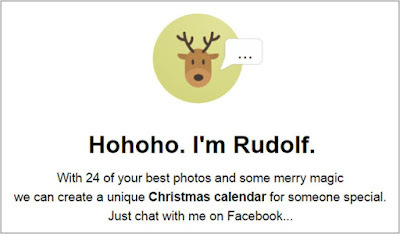 Rudolph Adventson Chatbot creates a Facebook Messenger Christmas advent calendar! New Facebook Messenger ChatBot Rudolph Adventson promises to create a personalised Christmas advent calendar for users of Facebook Messenger! 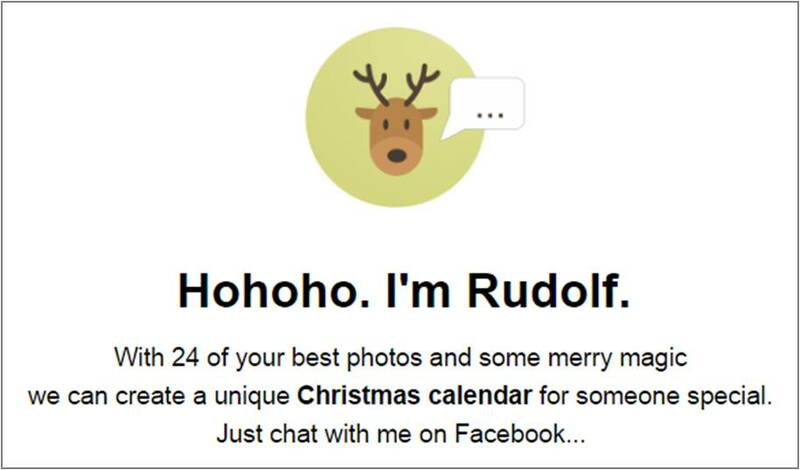 I am yet to be completely convinced about Facebook Messenger bots (still feels a bit like trying to put ad messages between SMS texts in the early days of mobile), but chatbots like Rudolph Adventson are starting to highlight the creative potential of the Messenger platform. 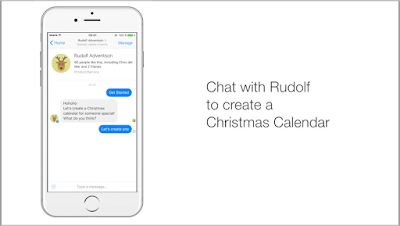 "Chat with Rudolph to create a Christmas Calendar"
"Starting on December 1st your loved ones can explore their christmas calendar on their smartphones, in which they can find and puzzle one of your 24 photos every day. A great way to count down the days until christmas eve and a great way to put 24 smiles on their face. So take your loved ones on a magical trip during this year’s christmas time and create a calendar for them!" Users of the Rudolph Adventson chatbot on Messenger upload 24 photos and these are given as 'gifts' one by one, day by day to a recipient who has installed the required app. As with many other Messenger bots, Rudolph Adventson will have the challenge of scaling to a meaningful level, but this looks a fun and interesting Messenger experience and I hope it does well!